I remember the days my children were born clearly…well, kind of. Some moments are crystal clear and will be etched in my memory till the end of time “Your baby boy has red hair!” “It’s a girl!” In contrast; many of the details were a complete blur — countless nurses, doctors, aides, monitors and medications. There were informational videos to watch, and tearful meetings with lactation consultants. The constant hum of activity allowed for very little sleep. As an audiologist, I know the importance of identifying hearing loss in children as early as possible. However, because my children were born in Ohio before 2004, only my son who was born with Down syndrome received a hearing screening. My other two children had no risk factors and, thus, did not warrant a screening. Fortunately, this has changed. Today, Universal Newborn Hearing Screenings (UNHS) ensure that all children receive a hearing screening before they are discharged from the hospital. Fifty percent of children born with hearing loss have no risk factors. We are fortunate now to be able to identify children who may have otherwise not been diagnosed until developmental delays associated with hearing loss (like speech and language concerns) emerge. The Early Hearing Loss Detection and Intervention (EHDI) program has a clear goal of having every child receive a hearing screening by 1 month of age, a diagnostic hearing test (if the baby did not pass the hospital screening) by 3 months of age, and enrollment in early intervention (if hearing loss is identified) by 6 months of age. These 1/3/6 month standards are nationwide. There also is a strong movement to meet these markers by a 1/2/3 month standard, as we know the earlier a child receives intervention for hearing loss, the better the outcome. Apparently, my son Jamie, who has Down syndrome, received a hearing screening in the days after his birth. I have no idea when (so much was a blur at that time). But, I do clearly recall talking with the nurse because he did not pass the screening. This meant we needed to bring him back for further testing. Given my profession, I was fortunate to understand that time was of the essence. The Auditory Brainstem Response (ABR) testing that they needed to complete to know how well my son was hearing required Jamie to be fully asleep. A newborn will sleep naturally and the testing can usually be completed quickly in the audiologist’s office. However, if we waited months to go back, there was a high likelihood that he would have to be sedated to get an accurate test. I definitely would have sedated had it been necessary, but was glad that was not the case. I knew that I needed to be sure that my son could hear, or if not, how much hearing loss there was and how to arrange to get help for him. How could I expect he would learn to talk if he could not hear? Like every mother, I wanted to do everything possible to help my baby. I quickly scheduled a follow up hearing test. When he was just a few weeks old, my husband and I brought Jamie back to the hospital for the diagnostic ABR testing. He slept in my arms as the audiologist taped wires (electrodes) to his forehead and behind his ears. Then the audiologist put little headphones on him that made noises and watched his brain’s response to those sounds. Jamie slept the entire time! It was easy, and I was thankful to learn that Jamie had normal hearing. However, given his diagnosis of Down syndrome, the audiologist suggested frequent (every 6 month) tests to monitor his hearing. Jamie also enrolled in early intervention through Help Me Grow. Jamie was eligible due to his Down syndrome diagnosis, however, this is the same program for which children who are identified with hearing loss are eligible. It was wonderful! We had a specialist who came to our home and helped our family work with Jamie to meet the goals we decided were important to us. The best part was that it was absolutely free. It did not matter what insurance (if any) we had. It is free to everyone. 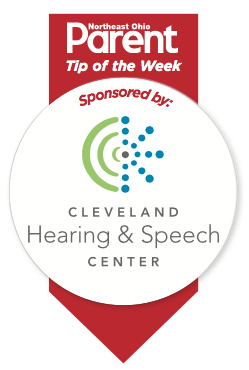 Cleveland Hearing & Speech Center has early interventionists that specialize in hearing loss. We work as part of the Help Me Grow team and go to a family’s home to help them understand their child’s hearing loss and how it may impact their child’s development. We help families identify outcomes important to them and help them achieve those outcomes. Every family is unique and has their own strengths and own dreams. Some families want to learn sign language and meet members of the deaf community. Some families need more information about technology such as hearing aids or cochlear implants. Some families want strategies on how to encourage language within their home. We know that babies and toddlers learn best in their natural environment so our goal is not to teach the baby, but to coach the parents so that they may be their child’s best teacher. Learning happens in every day routines and situations. We help families recognize and maximize those opportunities. Cleveland Hearing & Speech Center also has a team of audiologists. We conduct hearing testing at all three of our locations (University Circle, Broadview Heights, South Euclid), although we do not have the equipment to test a newborn. It is typically the large hospital systems that have the ABR equipment. However, our audiologists can test children from 9 months of age and up and we also fit hearing aids on people of all ages, including infants. If a child has a hearing loss, we hope to have hearing aids fit by 3 months of age. Access to sound is important as children are learning language. Children are like sponges and they spend the better part of the first year listening and taking it all in, and it is not typically until the second year of life that the words they heard begin to come back out. It is important that all babies have the opportunity to develop language. Every baby’s journey is unique; however, all parents need to know how well their baby hears in order to provide him/her with a language rich environment. If you have questions about your child’s hearing or about hearing loss, please contact Cleveland Hearing & Speech Center at 216-231-8787.